Summer has been rich here at Zaccho with spectacular work coming from our Company in Residence Amy Seiwert's Imagery and our young dancers in Summer Camp! We hope to see you in the studio this fall for Zaccho Dance Theatre's performances, classes, and workshops! for adults and kids start September 9! Bounce, flip, fly! Dancing in bungee and harness is always an entertaining way to spend the afternoon. Using both climbing harnesses and specialized bungee harnesses youth and adults can experience the underwater/on the moon weightlessness of bungee dancing. Space is limited so everyone has time to fly! Youth age 7-18 welcome with or without an adult! RATES: $45 for 1adult + 1child add $15 for additional each additional child. The colorful and whimsical imagery in Marc Chagall's paintings often touch children. This fall Marie Walburg will lead an exciting new aerial dance and theater performance workshop for children that integrates beautiful scenic elements designed for Zaccho's upcoming Chagall-inspired work, The View From Here. In this workshop, children will study Chagall's fantastic universe and explore some of his most iconic paintings through aerial dance, theater and ensemble movement. Family and friends are invited to come and see our work on October 14 at 2:00pm! Two weeks of ridiculously giddy flying for anyone who has always thought, "that looks fun!" Bouncing, flipping and making shapes disguise the muscle building and core work involved in both close-to-the-floor and mid-air bungee dancing. Adults of all levels . 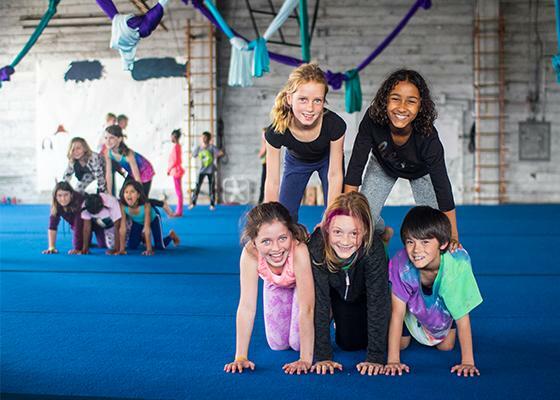 Register now for youth after-school aerial dance classes! Space is still available in these full semester classes running September 5- December 22. Check out MindBody for full descriptions!